The St. Martin he loved. The late Thomas Frank Hassell was born on Saba on December 12th, 1930. We now celebrate the life of our dear friend Frank who served his community in many different ways. Whereas in the great economy of Divine Providence, Thomas Frank Hassell, a much beloved member of the Anglican community was removed from our midst by sudden death after a prolonged illness on the 26th day of August 2013, and though we deeply deplore the loss of our friend, yet we bow submissively to the will of our Creator, who doeth all things well. He grew up here on Saba and was very much influenced by members of the Anglican clergy especially by Father Frank Prior who also served as his Sunday school teacher. Frank and his sisters attended the Public School in Windwardside where later the Hospital was located and then the Captains Quarter Hotel. The school was later moved to the back of the Old Post office which later became a library. His first teacher was Mrs. Sadie Dowling born Every. 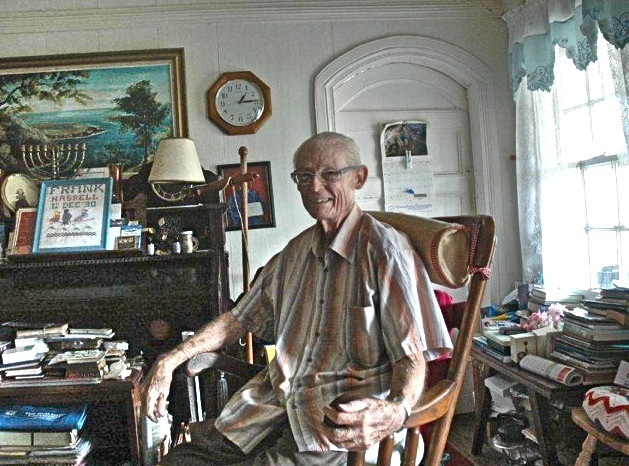 In 1948 he went to Saint Maarten to follow a teachers training program. He went along with a number of young people with whom he became life long friends. Among them were Leo Chance, Floyd and Henry Every, my brother Freddie, Carl Hassell known as “Fela’s Carl”, Howard Leverock and from St. Eustatius Cynthia and other members of the Heyliger family, Louise van Putten, Dennis Sprott, Elsie Woods and so on. He shared many experiences with them including surviving the hurricane of September 1st, 1950 at sea. The schooner the “Blue Peter” was not in service and the group left Saba on a sloop called the “Surprise” owned by Milo Tackling in Grand Case. It was under the command of Captain Ferdinand Brin of St. Barths. The sloop had first stopped at Statia and picked up the students from that island and then stopped at Saba. Frank said that when they left Saba in the afternoon of August 30th it looked very calm. Back then there were no weather reports like now. The weather picked up later on. Frank said that Capt. Brin was “drunk as a crow” and went down below to weather out the storm after suggesting that they should draw lots as there was a Jonah and board and should be thrown overboard. It was the mate Honora Flabian Richardson of Grand Case better known as “Captain No-No” who saved the day. When they arrived at St. Maarten the hurricane was already having a great effect and the waves crashing over the sand bar which protects the Great Bay harbor were so ferocious that Capt. No-No told them to go to the back hold on to the railing and he rushed the sloop through the waves and over the bar. Then the problem was how to get everyone safely to shore as many on board could not swim. Lt. Governor Walter Buncamper was also on board and a small boat managed to get a line from the wharf out to the sloop and the passengers were told to hold on to the rope and try and get in that way. The small boat moved back and forth with passengers and finally managed to get everyone safely to shore while the sloop ended up being tossed ashore and into Capt. Hodge’s back yard. The boys from Saba stayed at different homes in Philipsburg and Mr. Frank stayed at the home of Miss Browlia Maillard a retired Methodist school teacher who used her home as a guesthouse. After he became a teacher he became known as “Mijnheer Frank”. In our English speaking islands the Dutch word “Mijnheer” or “Sir” has become a term of endearment by pupils for their former male teachers. He started teaching at the Mount William Hill primary school. Among the pupils he taught there were Engineer Julius Lambert of the electric light company and Neville York the famous steel pan master. Mister Frank also taught on Aruba. Although he told me the years that he went to teach there and that he stayed with his father Thomas and a cousin Lovelock, neither his sisters or I can remember the exact dates. It must have not been more than a year or two in the early nineteen fifties. He came back to St. Maarten and continued teaching there. He gave night lessons as well at the Orange School the public school on Front street and helped out with playing the organ at the Methodist church. He learned the rudiments of playing the organ from his aunt Lena Hassell, but with lots of practice he became an outstanding organ player. As for the night classes all sorts of people attended these classes. I accompanied him once. I remember a character known as “Rumbero” who often had run-ins with the police. He walked into the class which was already in progress that night and sat in the back. One of the sentences on the blackboard was “Honesty is the best policy”. Mr. Frank read it off came back to it later on and called on “Rumbero” to explain what was written on the board. “Rumbero” obviously had policemen on his mind and enthusiastically shouted out; “Anderson (Vlaun) is the best police,” which brought with it a roar of laughter from the class. On St. Maarten he made many friends some of whom have remained his life long friends. He came back to Saba to teach after his father’s sudden death in 1958 and he taught first at the Public School in The Bottom but then moved over to teach with the nuns at the Roman Catholic School. After he started to live on Saba he became more involved with his church. He and his sisters became such a part of the Holy Trinity church that many in our community are wondering about the future of the church. He was a lay reader for his church as well and used to deliver a powerful sermon. Although as the old timers would say he was a “rank” Anglican that did not stop him from serving the Church of Rome as well when they needed an organist. Especially the village of Zion’s Hill has always been grateful for the many times he served as an organist for their church. Mister Frank loved history and was instrumental in writing the history of the Anglican Church and also helping Dr. Johan Hartog with his “History of Saba”, not only with the translation but also in correcting certain assumptions of Dr. Hartog’s which were not based on the true history of the island. Mister Frank was always preparing documents on the history of our people for the schools on the island as well. The life of a teacher was not easy back then. There were no photo-copiers or computers. Everything had to be done by hand and typed out on old manual typewriters. And what a lovely handwriting he had. A few weeks ago when I took his last will and testament for him to sign he doubted whether he would be able to sign the document. I said to him jokingly: “Come on Mister Frank let me see that lovely signature of yours one more time.” And he went on to deliver his usual great signature. Little did I know that it would be his last signature in life.He was very helpful in organizing the first Saba Day celebrations and he later on also wrote the Saba Flag song. He was always active in Queens Birthday organization. He received a distinction from Her Majesty the Queen for his years as a teacher and organizer of various events on the island. I did not know Mr. Frank as a boy growing up. By the time I was old enough to know who was who he was away to school on St. Maarten and would come here on school vacations. He was from my brother Freddie’s generation and they were good friends all their lives. I came to know him in 1955 when I was 13 years old and on my way to school on Curacao. I stayed at Miss Browlia’s home and guesthouse. Mister Frank and Dennis Sprott of St. Eustatius rented the small house in the yard. After school Mr. Frank walked me around the quaint little town and familiarized me with the people we met and the buildings which we passed. 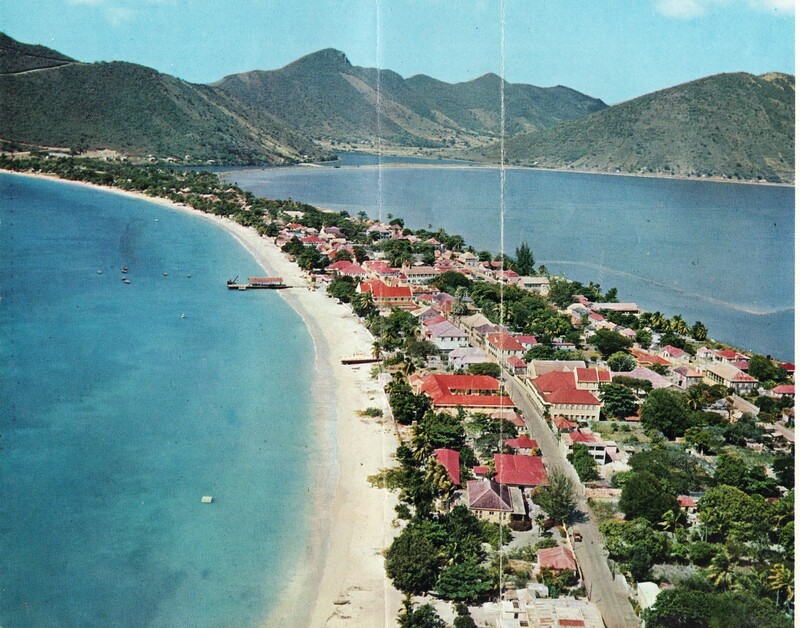 In 1955 St. Martin was a special place and Philipsburg situated between the Great Salt Pond and the beautiful white sand beach on the Great Bay, was the jewel in the crown of West Indian small towns along the seashore. I have written much about the idyllic life as it was back then with only 1500 people on the Dutch side and some 83 motor vehicles on the entire island. Up until shortly before he passed away he and I would be sharing stories about friends we knew over there and characters we both knew and cared for. Frederick Froston was the source of endless laughter when we talked about the antics he would pull off on his fellow citizens. Mr. Frank appreciated a good joke and people like Ruth Ann, the Methodist lady from Middle Region, who was always first to arrive at the chapel amidst lots of display and commotion, also “Mother-in-Trouble”, Camille Richardson or “Cam Brown” and a host of island characters who livened up the tranquil mode of life back in the day. It was a time when there was no television or other distractions so that there was much more concentration on people and on how they lived life and acted it out to the amusement of their fellow islanders. Mister Frank loved pulling jokes on people and once got me in trouble with our mutual friend Jocelyn Gordon who like his mother Emma, was very gullible. Jocelyn had promised to vote for me in the election. One day he called me from my sister-in-law Wilda’s house almost in tears. He told me he had to go back on his promise to me. Mr. Frank had also asked for his vote. He told me that Mr. Frank was his main source of transportation and thus his benefactor. He went ahead to quote Biblical verse to me as how one should reward benefactors. No matter how I tried I could not convince Jocelyn that our friend Mister Frank was no lover of politics and was certainly not running for office. Even though Mr. Frank told him the truth afterwards Jocelyn was still skeptical. The solution was that Jocelyn would ask for help at the voting booth and Mr. Frank would help him to vote and Mr. Frank saw to it that the vote was placed on the correct name. Each election after that Mr. Frank would warn me before the list of candidates was entered that the other party had asked him to run with them and he was taking it into consideration. Mr. Frank was an important source of information for my various writing projects. I have spent many pleasant hours on the phone with him and visiting his home trying to fill in the blank spaces of events and people we both knew. He pointed out omissions in my books which should be taken into future account. Up until a few weeks before his death he was correcting mistakes for me. bright sea-shells on the sand. Farewell Mister Frank and may you rest softly.